The Aurukun initiative began in late March, 2014, following an agreement between artist Samantha Wortelhock and the Royal Flying Doctor Service for “Sam” to work with clients of the RFDS Aurukun Wellbeing Centre to develop ideas for the mural’s design and then to express those ideas in paint. The work took place for three days every fortnight for three months. Marlene Dalton, Mental Health Recovery Practitioner with the Royal Flying Doctor Service at the Aurukun Wellbeing Centre, initiated the project. 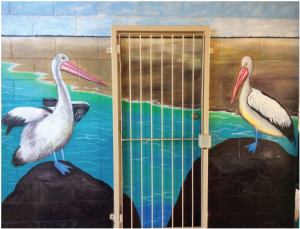 The healing or therapeutic value of the project was underpinned by an emphasis on physical health, which was helped by a donation of non-toxic paint from Byron Bay manufacturer ecolour. Thank you ecolour. The team loved working with your paints.